Emily May’s own horse assisted personal growth started at a young age. Little did she yet know it would be the time she spent with horses on the ground that would really allow their wisdom to help her fully reach her true potential. Starting riding lessons at age 7, she often found that her lessons taught her as much about her need for emotional agility as they taught her about riding. Experiences demanding patience and perseverance showed her early on the valuable teachings horses had to offer. Although Emily was never particularly interested in the competitive aspect of riding, the draw of the time she was able to spend with the horses at the riding schools kept her coming back for more. From a young age Emily also had a passionate interest in psychology and the power of counselling to heal the mind and at times even the body. After completing her undergraduate degree in psychology she knew her Masters would be the next step in allowing her to use a growing affinity for helping those in need. Years as a student saw her time with horses dwindle, and including them in her career seemed like an incompatible path. However, her life took a serendipitous turn when she was handing her resume out to various restaurants to support her educational expenses and she ran into some old family friends, who knew the city of Victoria better than Emily as she had moved from Toronto Ontario to attend the University Of Victoria. “Why don’t you go apply to the horse-drawn carriage company?” they asked. Her response was “What carriage company?”. As luck, or perhaps fate would have it the booth for the carriage rides was just a block away. The manager happened to have time to give her an interview right then and there, and he offered her a job on the spot. Already having looked into the eyes of the gentle giants, the magnificent draft horses that she would be working with all day, she had no idea that this was the first in a series of events that would change the course of her life and career forever and accepted the job offer. Emily started falling in love with the draft horses one by one. These gentle giants were stealing her heart and redirecting the trajectory of her life. Emily casually partnered with the owners of the carriage company to provide a small therapeutic riding program for children with behavioural challenges at a group home she had approached. She was amazed at how the horses commanded the respect and admiration of the children that came to the farm during this program. Inspired by this she also started volunteering with the Victoria Therapeutic Riding Association and soon found herself volunteering as an assistant instructor there. Researching a variety of Equine Assisted Learning and Therapy certification programs Emily came across the FEEL® program offered by Horse Spirit Connections and Mystic Waters Ranch. The program’s focus on honouring the horses as equal teachers spoke to her, and reminded her of the dynamic she had with the carriage horses that she so enjoyed. Entering the FEEL® program she was amazed at the change and growth she saw not just in testimonials and research supporting FEEL® work, but also in herself and her classmates as they progressed through the program. Emily was pleased to find her perfect fusion of psychology and horse teachings. After graduating from the FEEL® program in May 2018, Emily partnered with the owners of the carriage company to use their land and work with their retired draft horses. The dream she had been visualizing and putting energy into making a reality for so long had finally come to fruition. 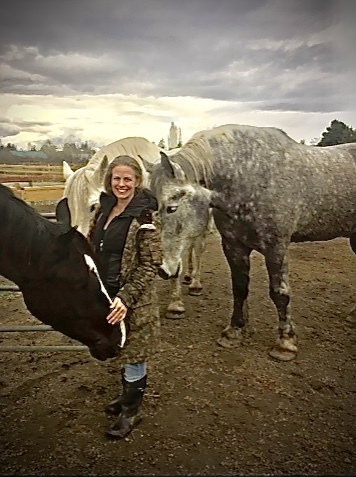 Today, Emily offers both Facilitated Equine Experiential Learning and Facilitated Equine Experiential Therapy sharing the FEEL® teachings with as many people as she can. Her program operates on a magical little slice of Vancouver Island where draft horses roam fields and forests in an area known as Brentwood Bay. Emily offers private and group seasons, as well as corporate team building workshops. Should you wish to experience the magic of Emily’s enlightened herd of gentle giants and the healings and teachings they have to offer, please call 250-208-4874or email emmay83@hotmail.com. More information on her FEEL sessions and workshops can also be found at http://www.horsewisdomfarm.com.